To be the first team to knock over all the cups of paper towel tubes and then place the words on the cups in order to spell out the Bible verse. 1. Before class write the Bible verse on paper cups, one word per cup. Write the words on the same word on the back and front of the cup to make them easier to set up. Make at least two sets. 2. Place a large ball of play dough in the large eggs and tape them closed. Make one egg for each set of cups. 3. Set up the cups or paper towel rolls like you would for bowling. 1. Break your class up into teams and give each team an Easter Egg. Line the teams up at the opposite end of the room from the cups. 2. On the word "go" the team members should take turns rolling the egg trying to knock over the cups at the other end of the room. The child who rolls the egg should go and grab it and bring it back to the next child in line on their team. 3. If a child knocks over a cup or cups, that child gets to pick up the cup or cups and place them facing up to the side so that they are in order to spell out the verse. 4. Keep playing until one teams has all their cups in order. 1. 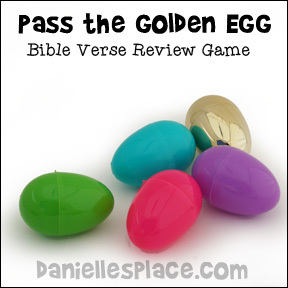 To collect all the words needed to spell out the Bible verse or verse phrase by having your egg land on sheets of paper with the words on them. 2. Or to gain points by answering questions about the lesson when your egg lands on a question space. 2. Tape the eggs closed. 4. 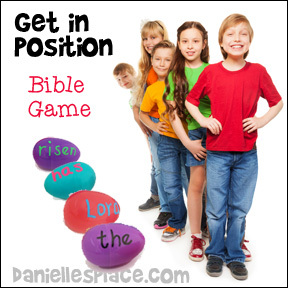 If you are playing the Bible verse game and have a lot of children, break them into teams. 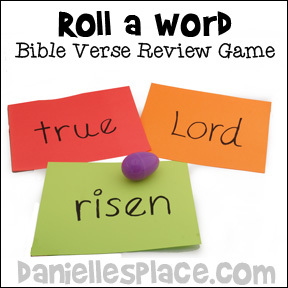 Bible Verse or Bible Phrase Review Game - Have your children or teams take turns rolling an egg across the room trying to get the egg to land on a sheet of paper with a word on it. If the egg lands on a word, the child who rolled the egg gets to write that word on the board under his name or team's name. The team that lands on all the words to spell out the Bible verse or phrase first wins. 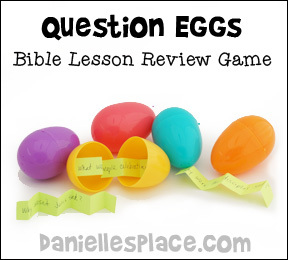 Bible Lessons Question Game - Have your children or teams take turns rolling the egg to try and get it to land on a question from the lesson. If the egg lands on a sheet of paper, the child or team that rolled the egg tries to answer a question. If the team answers it correctly, the team gets a point. If the team cannot answer the question, the other team gets a chance to answer the question and earn a point. Keep playing until all the questions have been answered at least once. To find eggs and gain points by answering questions correctly. 2. Hide the eggs in your room or outside in a play area. 1. Break your children up into teams and have them stand behind a line. (You can have them make paper bag Easter baskets before the game or just give them each a paper bag to hold their eggs. 3. When all the eggs have been found have your children open the eggs one at a time and try to answer the question in the egg. If the child answers the question correctly, he gets to keep the egg. If he doesn't know the answer, he passes the egg to the next child and that child gets a chance to answer the question. 2. Hide the eggs in your classroom or outside in a play area. 1. In class tell your children that on the word "go" they can go and find one egg. When they have found an egg they should then go and sit down. 2. When everyone who has found an egg a to look at the words on their eggs. 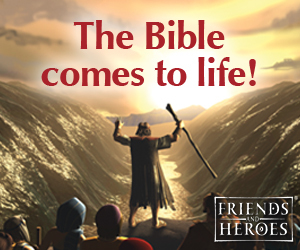 Write the first word of the Bible verse on the board and ask your children if anyone has that word. The child that has the egg with the word should bring it up to the front of the class and place it in front of the word you wrote on the board. Keep playing until all the children have placed their eggs. 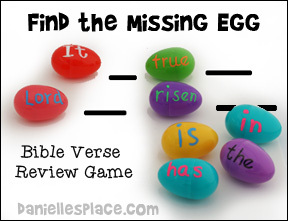 Objective: To be the first team or player to place all their Easter eggs in order to spell out the verse. 1. Before class write one word of the Bible verse on the Easter eggs with a dry erase marker or liquid chalk marker. (If you have a lot of children, you can make more than one set, or just use some eggs that have no words.) You can also decorate the eggs using liquid chalk markers. You can also use this as a craft. 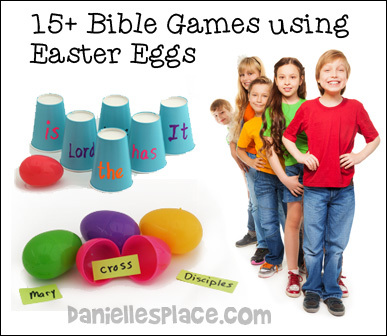 Assign each child a different word of the Bible verse and have them write the words on the plastic eggs and then decorate them with the liquid chalk markers. 2. Place the sets of eggs in Easter baskets. 3. Write the Bible verse on a board so that all the children can see it. 1. Go over the Bible verse that is written on the board. 2. Break your children up into teams if you have a lot of children. 3. Tell your children that on the word "go" they should take the eggs out of the Easter baskets and place them in order to spell out the Bible verse. 4. The teams or child who gets the words in order first wins. 1. Before class write words from the Bible verse on the plastic eggs. Write the same word at least four times around the egg so the word can be seen no matter how the egg lays. (Make more than one set of eggs.) Place the eggs in the center of the table so that all the children can reach them. 2. As you say a word from the verse tell your children to grab only the eggs with the word you say. (Say words that don't belong to the verse to confuse the children. Or say the words in the wrong order so children who grab too soon will have to listen more carefully.) If a child grabs a egg before you say it, or grabs the wrong egg, he must put all his eggs back on the table. Keep playing until all the eggs are taken. 1. Before class write one word of the verse on each egg. 1. In class place the egg on a table in the order of the verse. 2. Have your children take turns removing an egg and then saying the verse. The child who can say the whole verse without any eggs left wins. 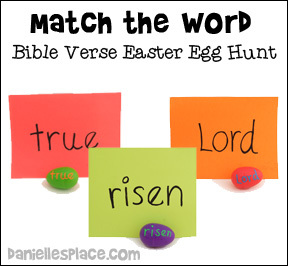 Before class write each word of the verse on Easter Eggs, one word on each egg. To make it harder you can include some words that don't belong in the verse. 1. 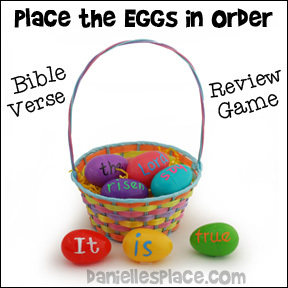 Place the eggs on a table or floor in the middle of the children so that they spell out the Bible verse, and then remove random eggs placing them to the side of the egg that spell out the Bible verse. 1. 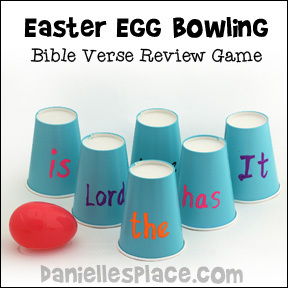 Have your children take turns picking an egg that has been removed and placing it where they think the egg might belong to spell out the verse. 2. If a child places an egg correctly, he gets to take another turn. 3. Once the whole verse has been revealed, you can start again, but leave out different word eggs. Before class write one word of the verse on each Easter Egg. 1. Have an Easter egg hunt, but tell your children that they are only aloud to find one egg. Also tell them that they cannot tell the other children what the word is on the egg they found. If you have enough children you can play with teams. Time the children to see which team can get in order in the shortest amount of time. 1. 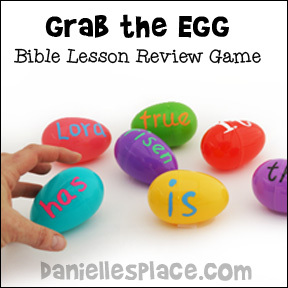 Write a Bible verse on the eggs, one word per note. Use only part of the verse for younger children. 1. Show your children the eggs, read each word, and place them in order. Tell your children that you are going to take one of the eggs away, and they must try to figure out which one is missing. 2. Tell your children to cover their eyes while you remove one of the egg. Mix up the remaining eggs so they aren't in order. 3. On the word "go" see who can tell you which egg is missing first. Replace the missing egg and play again. 1. Before class write words from your Sunday school lesson on the eggs place them in the center of a table so that all the children can see them. You can use the words more than once on the eggs. 2. In class tell your children that they should pick up any of the eggs that have words that you say during the lesson. 3. The child with the most eggs at the end of the lesson wins. You can also have the children tell how each word egg they collected relates to the story. 1. 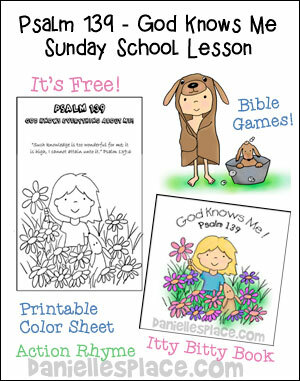 Before class write words from your Sunday school lesson on piece of paper and stick them in the eggs and place them in an Easter Basket. 1. In class tell your children to pay attention to the lesson because they will be using the eggs to review the story. 2. When you have finished the story or lesson, select one child to pick an egg from the basket, open it, and read the word. Tell that child to explain how the word relates to the lesson. If the child answers correctly, he gets to keep the contents of the egg. If he doesn't know, he passes the egg to the next child who gets to tell how it relates to the story. Keep playing until all the eggs are open. 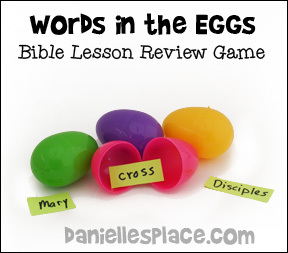 Before class write words relating to your Bible lessons on small sheets of paper and place them in the eggs. 1. Pick one child to start the game. The child picks an egg, opens it, and reads the word or words in the egg to himself or herself. 2. The other children take turns asking one yes or no question and then try to guess what the word is. The child who guesses correctly gets to pick the next egg. To make the game easier, you can pick categories such as people, places, miracles, actions, etc. and write them on the board before class. When a child asks a question from the categories mark it off on the board so another child won't ask the same question. For example, if a child asks, "Is it a person? ", mark off person on the board. 1. Before class write all the words from the verse on the eggs, one word per egg. Make several sets. Mark off a start and finish line with tape. Place a set of eggs at the start line of each team. 2. In class place your children into teams and line them up at the start lines. Give each child a spoon. 3. To play the child at the beginning of the line places a egg on their spoon. Then runs across the floor to the finish line without dropping the egg. If the child drops the egg, another teammate must pick it up and place it back on the player's spoon. The player may not touch the egg with his hands to pick it up. Once the player gets the egg to the finish line, he must push it in order with his spoon to spell out the verse. The team that gets all the eggs in order first wins. 1. Have your children stand or sit in a circle. 2. Give each child an Easter Egg and one child the golden egg. 3. Play some music and tell the children to pass the eggs while the music is playing. When the music stops the children should stop passing eggs. 4. The child holding the Golden Easter Egg has to answer a question from the lesson, if he gets it correct, he gets to stay in the game. If he answers incorrectly, he sits out the game. Take one egg away each time a child is out. 5. The child that is left wins the game. Children's Ministry Magazine has some great ideas to help you share the good news with the children and their families in your community. 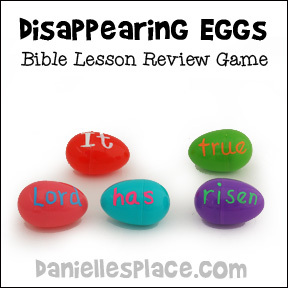 Add this game to your Sunday morning activities to engage preschoolers, and start a conversation about the wonderful surprise of Jesus' resurrection. Place small items in the eggs and tape them closed. In class have your children shake the eggs and try to guess what is in them or match eggs that make the same sound because they have the same objects in them. When they are done playing with the eggs ask your children what they think is in the eggs and then open the eggs to reveal the surprise. Discuss how surprised everyone was when they discovered that Jesus was no longer in the tomb. 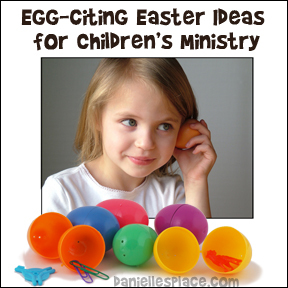 Children's Ministry Magazine has more egg-citing crafts and games to help put excitement into your Easter celebration. Check out their "Basket Full of Easter Ideas". 1. 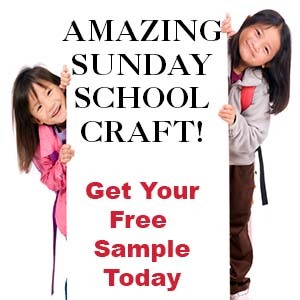 Give each student or group of students a sheet of Resurrection Scene Stickers. 2. Take turn asking children questions about the Easter story. If a child or group answers the question correctly the child gets to add a sticker to his or her sheet of paper. 3. The group or child who finishes first wins.